Most of the pathology of syphilis is the consequence of widespread microscopic vascular compromise caused by obliterative endarteritis. 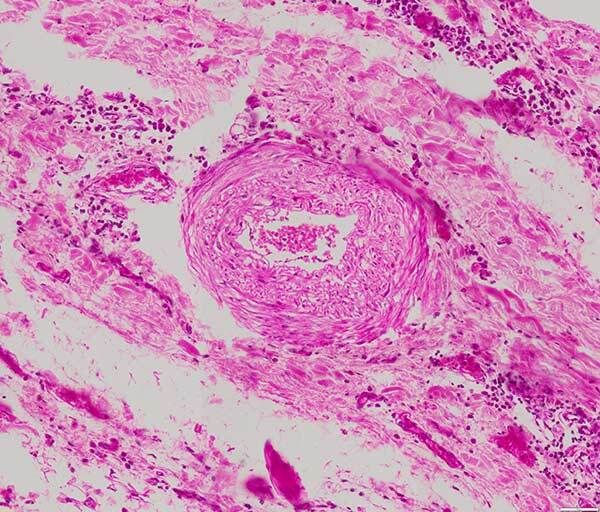 Obliterative endarteritis is characterised by concentric endothelial and fibroblastic proliferative thickening, leading to obstruction of small arterial vessels. It occurs in all stages of syphilis. Its pathogenesis is not known but in the lesions treponemes are scarce while the inflammatory infiltrate response is intense, indicating that the immune response is instrumental. This is an example of obliterative endarteritis affecting the vasa vasorum in the adventitia of the aorta (from a case of syphilitic aortitis). "the course, stages, and pathology of human syphilis… are determined by the balance between delayed-type hypersensitivity (DTH) and humoral immunity to the causative agent, Treponema pallidum. A strong DTH response is associated with clearance of the infecting organisms in a well-developed chancre, whereas a cytotoxic T-cell response or strong humoral antibody response is associated with prolonged infection and progression to tertiary disease (in 1/3 patients). Many of the protean symptoms/appearances of secondary and tertiary human syphilis are manifestations of immune reactions that fail to clear the organism, due to a lack of recruitment and, more importantly, activation of macrophages by sensitized CD4 T cells."